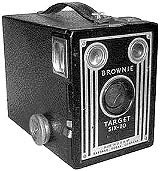 My grandfather Deich gave me my first camera, a Brownie box camera that used 120/620 film, had two viewfinders (one for vertical shots, one for horizontal), but one shutter speed and no exposure control whatsoever. I took the Brownie to Gettysburg, Atlantic City, and the NY World’s Fair in 1964 (where I made very odd choices about what to photograph with my one roll of film). From the start, I enjoyed experimenting with composition and exploring the limits of what my equipment could do. A regrettable side effect of this was that, throughout my childhood, I took too many photos of places and things and not enough of people. When we went back to the World’s Fair again in 1965, I had a new 126-film Flashcube camera–but, apparently, still only one cartridge of film. It was that GAF Anscomatic which captured all my junior high and high school snapshots, which went to Cape May and Philadelphia and Watkins Glen. But I lost the camera on the return leg of a 1972 trip to East Lansing to take the Alumni Distnguished Scholarship Test, and I was still cameraless when high school graduation rolled around. This would not do, and in July, 1972, I bought the first of what would eventually be three Canon 35mm SLRs–a TL-QL with 50mm f1.8 FL lens. I added a 135mm portrait lens a year later, and that rig carried me through college and my first few years teaching. In December 1980, I stepped up to the FD line by adding an AT-1. A Vivitar 85-205 macro zoom and SunPak 933D filled out the camera bag. I shot mostly slide film, in part to save money, in part because I believed the projected color transparency superior to prints of any obtainable size. Because of that, I never had a darkroom or took much interest in darkroom techniques and enlarger tricks. Also because of that, many of my best photos are trapped in metal boxes and little cardboard mounts, unseen for years, and on the wrong side of several hundred dollars of being scanned. By 1983, two things had changed–I was a father, and I was writing full time, in part as the Middlebury-Bristol correspondent for The Elkhart Truth. Both roles called for a less deliberative style of photography. At the end of the year, I picked up a Canon AE-1 Program FD-mount body for myself, and a Canon Snappy 20 for my wife Karla, who had asked for a simpler, lighter camera for her to use with the baby. At this point I made an almost complete transition to print film, shooting color slide only as needed for publication (the b&w print and the color transparency being the staples of newspaper production at the time). The AE-1 Program was my workhorse camera for the next decade and a half, going with me to more than 24 states and 70 conventions, and capturing most of the images which have been published over my name. News photography taught me that film is, after all, cheap–it’s the photo you didn’t take that’s dear. Instead of trying to make every photo count, I concerned myself more with getting “good coverage,” content to get four or five album-worthy photos–or one publication-worthy shot–per roll. Bracketing exposures and switching on the motor drive to shoot three to get one became habits. I took my Canon kit to Kennedy Space Center and the Serpent Mound, through Pinnacles National Monument and Mammoth Cave, and around Crater Lake. I shot ultralights, science fiction writers, warbirds, astronauts, wind tunnels, belly dancers, shipwrecks, and a few–too few–lovely naked women. But on the family snapshot side, just as Karla wouldn’t settle for only 4 or 5 prints from a roll of slides, my second wife Gwen wouldn’t agree to a “greatest hits” approach to family albums, highlighting only the best 4 or 5 shots from a roll of prints. So I drifted back toward a mentality I called “80% keepers,” especially when using one of the series of ever-more capable compact 35mm cameras that succeeded the Canon Snappy in my household–a Nikon Zoom Touch 400, an Olympus Zoom 211, and most recently a Vivitar PZ3125 with its 38-125 zoom. The pocket-size Olympus in particular spoiled me. Even if I left the other bodies and lenses behind, the AE-1P with its zoom and motor drive was a handful to lug around for an all-day event like an air show. Morevoer, the US ban on mercury batteries left me without a ready source of PX-13 meter batteries for the two earlier Canon bodies. (Any Canadian friends out there who’d like to help me out?) The family archivist in me is grateful for the date imprinting of the Olympus and Vivitar, even if the would-be art and glamour photographer in me shudders. 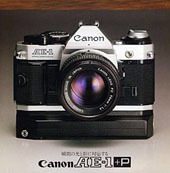 When the AE-1P developed a sticky shutter (a common problem for older Canons) just before a big event, the SLRs lost their place in the starting lineup and now rarely get playing time. I take the Vivitar to air shows and on research trips, and I’m not above throwing a disposable into the mix for a family vacation or other hostile environment. Undoubtedly my next camera will be a digital–I have an eye on one which I think would satisfy me. But there isn’t enough money to reach that far down the wish list yet, and I still weigh the prospective outlay against the cost of a proper cleaning and tuneup for my old friends in the big blue camera bag. We might have another trip or three in us–one more Shuttle launch, one more naked woman, for old times’ sake. 2016 Update: After toying with a second-hand Kodak Dc120 for a couple years, our family finally went fully digital in 2007, just in time for a family trip to Disneyworld. I bought each family member a used digital camera on eBay; mine was a 3.2MP Olympus C740. 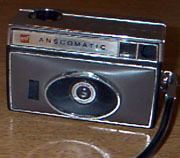 I took about 10,000 photos with it before moving on to a more muscular Olympus, the SP800UZ bridge camera. Four years and 25,000 photos later, I graduated to my current digital–a 16MP Nikon P610 ultrazoom bridge camera. The last roll of film to pass through my Canon SLRs captured images from the rim of the Grand Canyon in 2005, at the end of a three-day all-film drive along the route of US Highway 66. I never did make it back to Florida for another Shuttle launch, and cheerfully naked women have been unaccountably scarce.